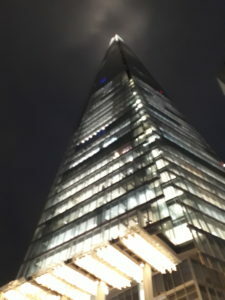 We travelled to London and met with the NI diaspora, to network, hear talks from Belfast for Life stakeholders, and discuss what Belfast has to offer for those wishing to return – or re-locate for the first time – to the city. If you couldn’t make it to our Belfast for Life Diaspora Event in London here’s a quick rundown of what you missed and what there is more of in the coming year! Despite the awful weather the welcome was warm in EY’s in-house restaurant and exhibition space: The Mulberry at their More London Place headquarters. Overlooking HMS Belfast, felt like a suitable location for a Belfast for Life event in the heart of London. Originally from England, Ruth moved to Bangor with family 4 years ago. 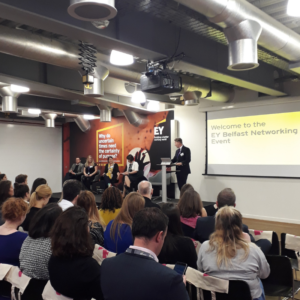 She has been an integral part of the ‘Journey to 500’, meaning Ruth is well placed to share how EY Belfast has doubled in size over the last couple of years. Ruth, who prefers the weather in NI to London, told us that EY are the best company to work for. They are currently seeking talent to join their Belfast office from further afield. Victoria, originally from Oxford, has made Belfast her home following a career change to the tech scene. 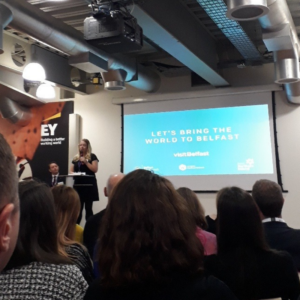 Drawn by the booming Belfast tech space, and kept here by a love of the culture and craic, Victoria told us that now is a great time to be in Belfast for those who want to progress in the tech industry. This is due to the 70+ tech meet up communities, foreign direct investments, and multiple start-up companies where the savvy can excel. Victoria chose to make Belfast her home despite the culture shock of receiving two types of potato with her ‘Sunday’ roast! 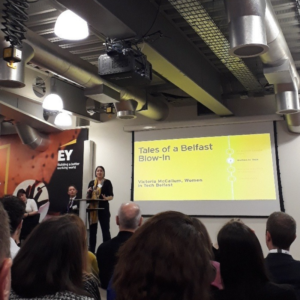 Sarah opened her presentation with an inspiring video showcasing the elements that make Belfast a place to learn, live and work. presented the mutual benefits of becoming Belfast Ambassador, bringing conferences to Belfast, and the great platform that Visit Belfast can provide for companies to leverage. 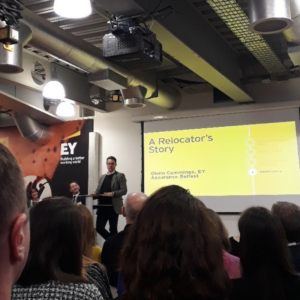 Having recently taken the plunge and moved from London to Belfast with his young family Glen told a re-locator’s story. Coming home to be near relatives was the drive behind the move. Being a 20 minute walk from work was a pleasant surprise. And with their new car they could be at the beach in no time. Glen’s story was indicative of the experience of the returning diaspora, that his new found work/life balance was worth the upheaval of moving his family home. Justin compered the event and telling us the Belfast for Life programme was designed to be a touchstone for the NI diaspora worldwide. Justin has an holistic approach to life and work and this has led the programme to be great success as a resource for re-locators.